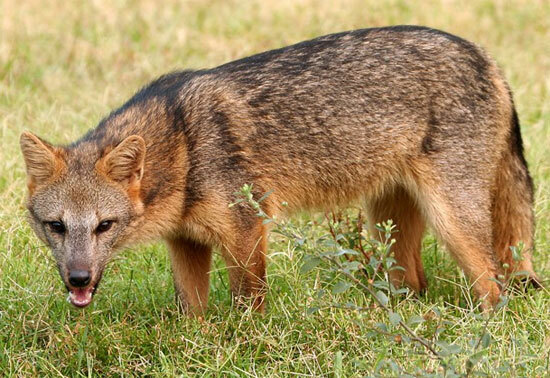 Crab-Eating Foxes can be found in the open woodlands and grasslands of South America. Crab-Eating Foxes are omnivores and they mainly feed on crabs, fish, reptiles, birds, rodents, insects, eggs and fruit. After a gestation period of 52 - 59 days, Crab-Eating Foxes give birth to 2 - 6 cubs. They are weaned at 3 months old and reach sexual maturity at 9 months old. Humans are predators of Crab-Eating Foxes. Cerdocyon thous thous - Venezuela, Guyana, Surinam, French Guiana & North Brazil. Cerdocyon thous azarae - North Brazil. Cerdocyon thous entrerianus - Brazil, Bolivia, Uruguay, Paraguay & Argentina. Cerdocyon thous aquilus - North Venezuela & Colombia. Cerdocyon thous germanus - Colombia.